The Mueller Investigation looks to be coming to an end though according to those in the know is unlikely to bring closure but it may provide pointers – “a road map” – to further investigations by Congress and additional criminal proceedings by other prosecutors. Thus the end of the beginning, not the beginning of the end. 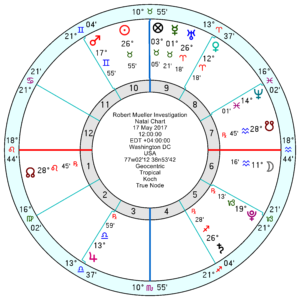 Mueller, 7 August 1944, a controlled Sun Pluto in Leo, does have a sigh-of-relief tr Uranus trine his Jupiter from mid April for a few weeks and again across the New Year. So he’ll be pleased to lay down some of his burden. 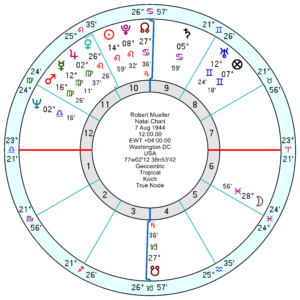 And at the moment till late March he has similar from tr Pluto opposition his Jupiter/Uranus midpoint, and that repeats till late 2020. 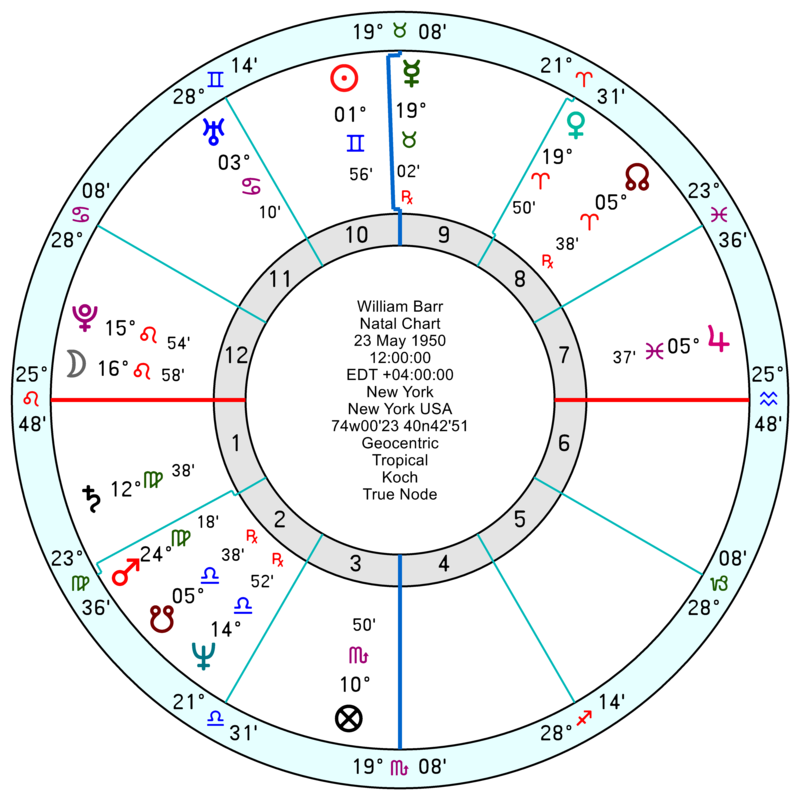 However he’s also got the undermining tr Neptune opposition his Mars in Virgo in March and that repeats late in the year. So half boosted and half deflated. His relationship chart with Trump looks edgy, jangled and discouraging at the moment; insecure from July and in a state of upheaval come 2020. So the repercussions will presumably roll on. His relationship chart with William Barr, the new Attorney General, who has the job of deciding how much to make public, looks highly pressured and blocked from April onwards; and unsettled July to September; worse in 2020/21. 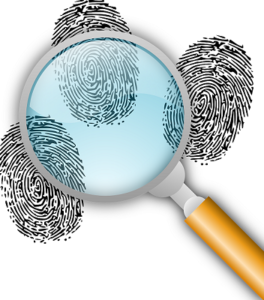 The Mueller Investigation chart, 17 May 2017 looks to be sagging more than somewhat through April onwards, but that could just be it closing up shop. 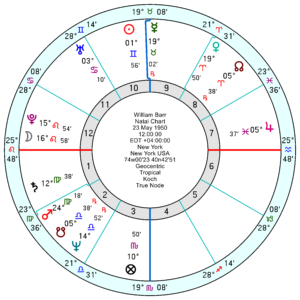 William Barr, 23 May 1950, over whom Trump is pouring treacle and honey to keep him sweet (he hopes) is an expansive Gemini square Jupiter with a hard-working and serious Mars and Saturn in Virgo both trine a practical Mercury in Taurus. 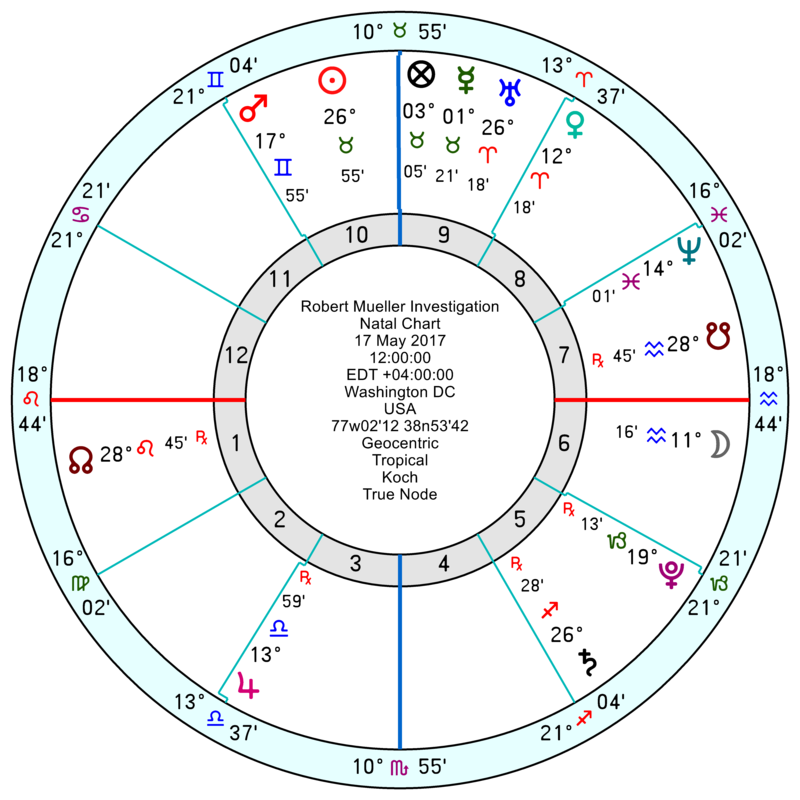 He’s trudging through thick mud now till late March; highly-strung and on edge in April and devastated May to mid August with a catastrophic tr Neptune opposition his Mars/Saturn midpoint – and that’s around into 2020 as well. He’s picked up the poisoned chalice and will have to run with it. For Trump time line see post February 15. Also, people are so concentrated on Manafort and Cohen that they are completely ignoring Flynn part of the probe. Flynn’s sentecing was postponed, and both parts of the case gave until March 13th to file a status report on that. I’m fairly confident nothing will happen to Mueller Probe before Flynn’s sentencing. I think they backtracked on this statement yesterdays, saying there won’t be a report in “coming weeks”. This is very typical of Mueller reporting. Mueller or his team don’t talk. So, what happened here was another journalist trusting their, I’d presume, longtime, reliable DOJ sources. 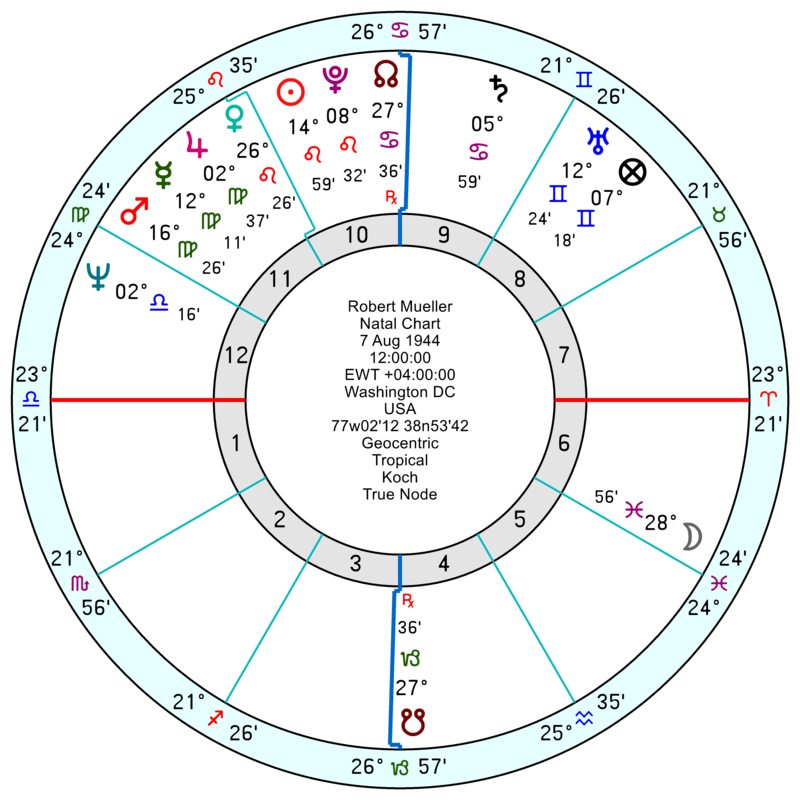 Capricorn Stellium will undo Trump Oresidency, as well as Uranus in Taurus. Melania may declare her marital independence. Barr and Mueller have a good past relationship. The pressure will be on Barr to indict Trump as a sitting President. Where is the democracy when one man gets to decide whether the truth goes public or not. “We both have truths. Are mine the same as yours?” Famous line from a musical, long ago. But really, it isn’t about democracy or a constitutional republic defining or deciding to allow truths to be easily evident. Any thoughts on Trump’s buddy – Robert Kraft Marjorie? He was charged with soliciting in FL. He was born on 5 June 1941 in Brookline, MA. Thank you if you look into and have a nice weekend. I believe Kraft has dementia – it was reported a couple of years ago. It might explain some of his behavior, which is incredibly stupid. Hmm, now it looks like that report was satire. Never mind!